So, you’ve decided to begin a new market research project. You’ve got your email database that you’ll send the questions to and you’ve opened up your market research provider’s survey builder to create the survey. You may have done it dozens of times before; that is, begun a research project knowing that what you’ll get back is a group of conclusions about your group and segments of your group, which may be by any combination of demographic criteria. When you’re done with the research and analysis, you’ll have a team meeting, report on the results and maybe test a few changes in your marketing or sales plan. Sorry, that’s not good enough. Does your research platform automatically append every response to the respondent’s email in your database? Can you convert zips to cities, states, regions, or countries with one click? Does it enable you to ask and analyze responses to open-ended questions, without limit? 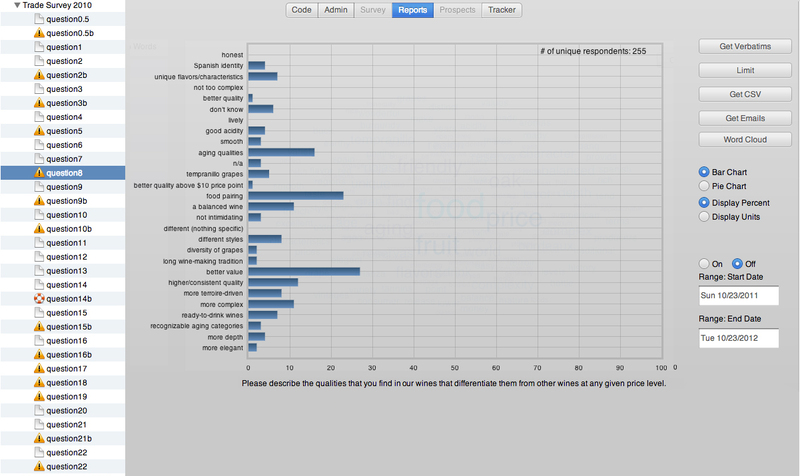 Can you see all the language that was used by respondents to open-ended questions by simply clicking on a word? Can you convert words into phrases and segment your database based on emotions, frustrations or perceptions? Can you convert word clouds into bar charts with one click? Can you create a lexicon of common words or phrases that your database uses? Can you send your questions out to any number of people, 10,000, 100,000, 1 million without an upcharge? Can you ask the same database some questions tomorrow and then ask a different set of questions next month without an additional charge? Can you create and analyze segments based on any combination of closed- or open-ended responses? Can you save segments and know that they’ll automatically build as you add new people to your database? Can you create a segment to ask clarifying questions or send them an email tailored to their frustrations, needs or opinions, all within the same platform? In its full application, Oomiji is a customer engagement tool because it enables you to learn what your customers are thinking, acknowledge their comments and then respond to them based on what they’ve told you. If you think about it, that’s just how we build relationships when talking to each other 1:1. It makes sense and while you’re at it, you get a pretty amazing research tool that gives you more than your money’s worth. You can learn more about Oomiji at oomiji.com or watch an intro video here. Where does good strategy begin? There’s always a rush these days to get plans into action. Action is what we value, just as we’re always looking for someone who “can hit the ground running”. But what if they’re running in the wrong direction? And how do you know in which direction to run? The answer to that mistakenly comes in businesses doing what they’ve always been doing and whenever possible just running faster. In the accelerated competitive environment of New York City, we’ve become accustomed to stores, restaurants, professional services and even hospitals suddenly disappearing. These businesses failed even though they worked harder and ran faster than anyone around them. Why did they fail? Most likely, they never asked their customers whether the direction they were going, the products and services they were offering or the benefits they perceived internally met customer needs. It’s the rare manager or entrepreneur who can intuit what the market is looking for. Otherwise, there would be a lot more people like Steve Jobs around. Businesses have to get feedback from their customers and understand how to match their offerings with what customers are seeking. Not surprisingly, customers often see product plusses and minuses in completely different terms than the companies selling them. The best advertising campaign in the world won’t convince customers that they should be seeking something different. We’re just not in that linear world of the 1950s and 60s when we could be told what detergents make our clothing cleaner and then march in lockstep to the store to buy them. Several years ago, we were asked by the Chilean Pisco industry to provide a strategy that would open up the U.S. market for them. If you don’t know Pisco, it’s an eau de vie, somewhat like a refined grappa, that’s made in Chile and Peru. Our research found that bartenders believed it made most vodka-based cocktails more interesting and one of our key strategic recommendations (futureshiftpisco.com) was to unleash the creativity of bartenders with a series of tactical programs that would challenge them to develop great Pisco-based cocktails that their customers would love. But Chile is a country where perfection in planning is highly valued and established. That works when building bridges, tunnels and skyscrapers, of which you’ll see many in Santiago these days but not when variable decisions are involved as with bartenders and their customers. The Chilean Pisco industry decided to design several “perfect cocktails” that they could then promote in the U.S. The result? Peruvian producers who gained a better understanding of the U.S. bartender now dominate the market. There’s still time for Chile to adapt as Pisco still is not well known in the U.S. They simply have to acknowledge that their customers have more power than they do. Easy, right? While we’re on Chile, let’s move to technology. This time the Chilean technology industry told us they wanted to sell their growing tech industry to U.S. companies. Chile had already achieved tremendous success in establishing itself as a successful place to locate an offshore tech center. Now, they wanted to have a presence inside the U.S. to provide SaaS and enterprise integration products. Again, we spoke to prospective customers for these talented Chilean companies and were told that if they could establish partnerships with Chilean companies in Latin America, a piece of their U.S. business would likely follow. (FutureshiftChileIT.com)In other words, help us in your territory and then we’ll reward you in ours. U.S. companies wanted to understand the Chilean miracle and how it had become an export powerhouse. But just as with Pisco, the forces that worked internally in Chile were too strong to persuade them to adopt a market-oriented strategy in the U.S. Six Chilean IT companies came to the U.S. trying to sell their services based on low prices. But why go to a company thousands of miles just for low prices when that can be found down the road? Today, there is only a small amount of programming work going to Chilean companies, as talented as they are. Most recently, we conducted a research and strategy project for the Maine lobster industry. Following 200+ interviews, there were a number of findings in that report that showed how Maine lobster possesses attributes to restaurant and hotel chefs that were not being considered within the industry. 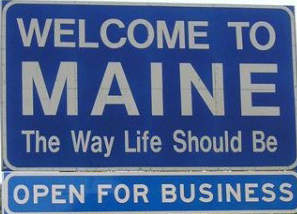 There is ample opportunity for the Maine industry to differentiate its brand from all competitors. However, lobstering is a traditional industry and change does not come easily. 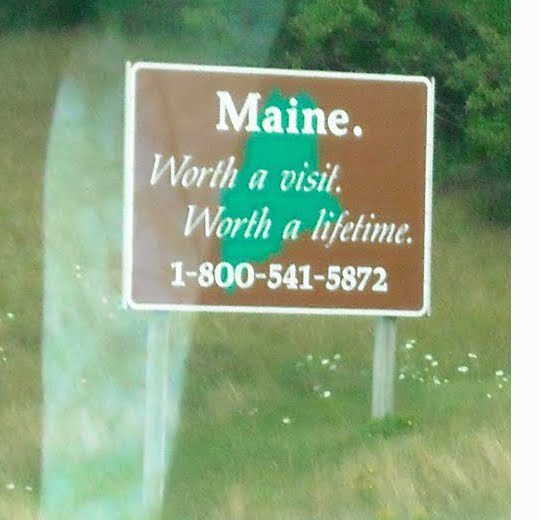 Like the two Chilean examples, internal beliefs in Maine are strong. 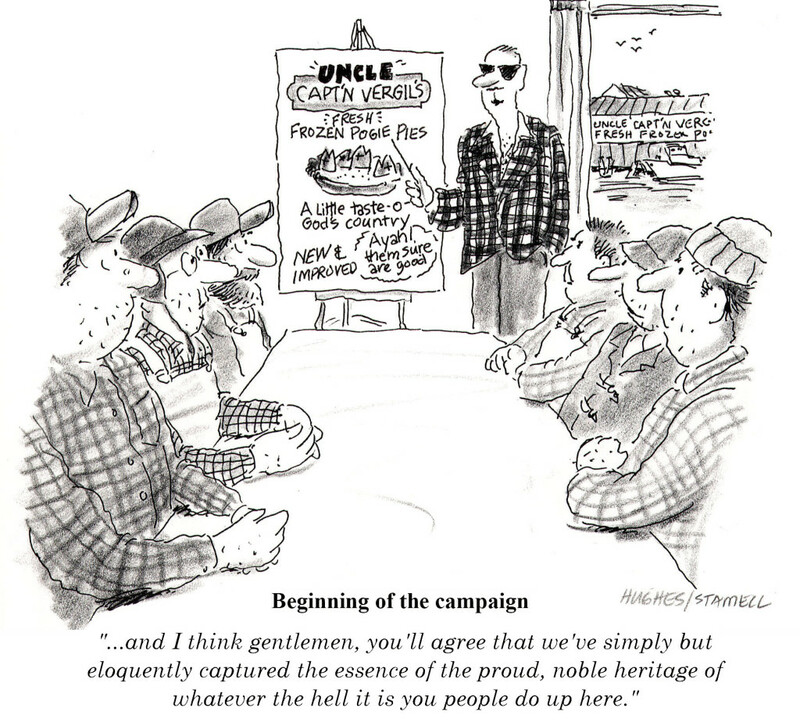 Most lobstermen are focused on their first transaction with a dealer when they bring their catch to the dock. The needs of restaurant and hotel chefs can be perceived as a distant concept and there is little patience for the time it takes to raise the foodservice market’s demand. The local dealer and summer tourist who loves to sit at the water’s edge, even though they both pay rock bottom price, is more concrete. 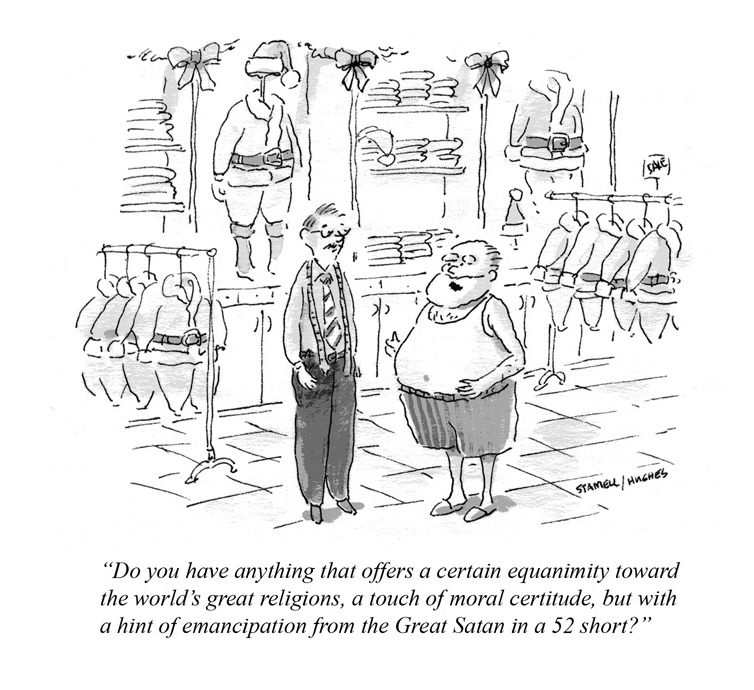 It’s been that way for more than a hundred years so change, despite market feedback, isn’t easy. There’s cause to remain optimistic but it remains to be seen whether Maine’s lobster industry adapts. In each of the above cases, the right strategy began with listening to customers. That helped set a direction for the industry to go. But at that point, industry members often put up obstacles to change. After all, it’s far more difficult to do something new than the things you’ve been doing for dozens of years, even though they may not be working. FutureShift develops brands and rebranding programs by understanding how customer decisions can increase engagement and loyalty. Business managers and their consultants often talk about strategy, yet they frequently misunderstand what strategy is, why it’s important, and how objectives, strategy, tactics and goals are related. The confusion seems to exist because our business culture values action. “I’m looking for someone who hits the ground running,” is a common refrain from CEOs who believe action is what creates results. But the real question is “what direction are they running?” Action without direction is meaningless or even harmful to the potential success of a business. It’s simple enough to say that “objectives are measurable, strategy is direction, and tactics are actions.” Yet, the question still asked is: “How many strategies should we have?” Of course, if strategy is direction, how many directions can you go at the same time? No wonder we’ve become accustomed to business plans underperforming. Marketing departments and their agencies often don’t know what direction they’re going or they create separate strategies for each tactical execution. 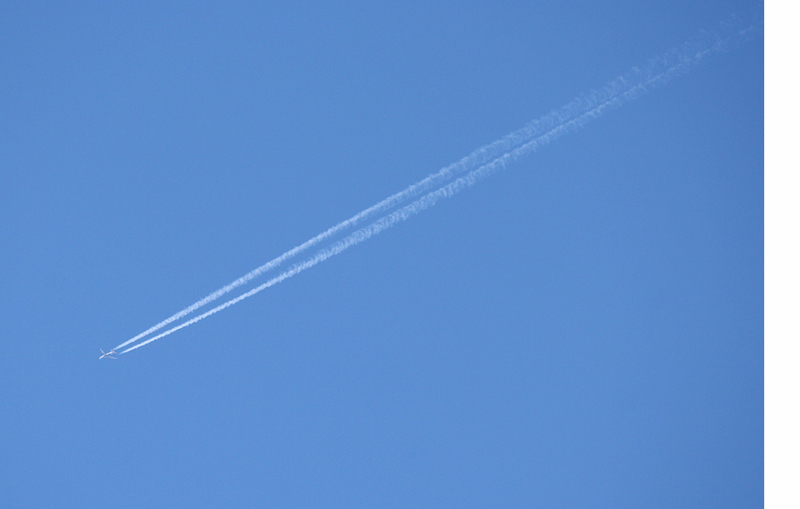 Consequently, tactical programs may have no clear direction or consistent messaging and the result is that they get lost in the competitive clutter. A clear example of an objective, strategic options, and tactics may help clarify the confusion. Suppose, for example, we decide to sail a boat across the Atlantic Ocean. This isn’t something most of us will ever do but objectives, strategy, tactics, and goals as well as research, even management teams, become crystal clear when setting out to cross the ocean and they’re no different than they are in business. For fantasy purposes, we can become part of the idle rich and plan to sail our boat from the Chesapeake Bay area to the mouth of the Mediterranean in late June. Why not? The Mediterranean is a nice place to spend the summer. Since we’re in a hurry to get there in time for party season, we’ll set an objective of reaching the Mediterranean in 20 days. So now, we’ve set an objective and it’s measurable. We can break it down further to measure our progress along the way. It’s about 3,800 miles in a straight line across, which means we’ll have to average about 190 miles every 24 hours. That will require an average speed of 7 nautical knots per hour (a little more than 8 miles per hour). That may sound slow but we’re dependent on the vagaries of the wind and weather conditions as we sail across. More importantly, we now have a set of metrics by which we can measure our progress, a key component of objectives. To take our fantasy voyage further, we’ll need a boat and considering our objective, we might want one that’s about 60 feet long, something like the one in the photo. This boat is called a Swan 60 and is made by Nautor in Finland. Nautor makes safe, fast and beautiful boats and we’ll pay a pretty penny for the privilege of owning one. Fully equipped, we’re looking at around $3.5 million but hey, it’s only money! The good news is that the Swan 60 has what’s called a hull speed of about 10 knots (approx. 11.5 mph). Without going into a technical definition, hull speed is the approximate maximum speed a boat can go. The exception to hull speed is when a boat surfs in high winds on top of the waves. 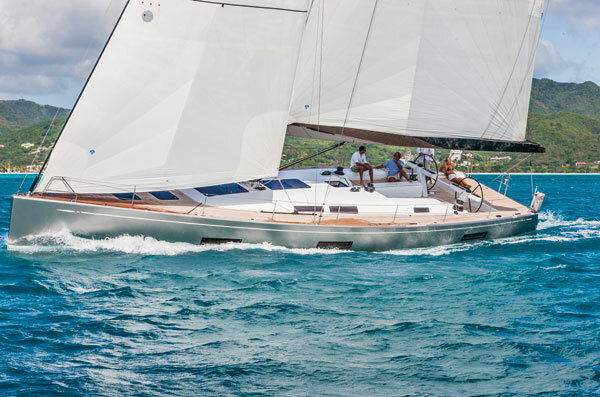 If we can get our Swan 60 surfing, we can probably sail at speeds well over 15 knots. So averaging 7 knots across a 3,800 mile span of ocean does not seem out of the question. Now we have our boat and you can think of it the same way as we might a business. It has an owner (a wealthy one) who may or may not be “skipper” (no jokes please) or managing director. We’ll need a navigator, who can be compared to a combination of a Chief Technical Officer and Chief Strategy Officer, and a Tactician, our Chief Operating Officer to keep us going at maximum speed. Then we’ll need some specialists, people who excel in working in different areas of the boat and handling a 60-foot yacht’s large sails. Also, we’ll need an experienced sailboat cook who knows how to keep a crew happy while being tossed around in large waves. We’ll want experience all around as ocean sailing is not for novices. In all, our team may total 14 people. Our boat only sleeps seven but we’re sailing non-stop 24/7 so we’ll need enough people to manage the boat while others sleep. You can see by now that we’re building a small company that has an ambitious objective. Now, it’s time to select a strategy, a direction we’ll take to reach the Mediterranean on time. We have some difficult choices to make. It’s time to do some research. We’ll study historical weather patterns, learn the prevailing winds, ocean currents, note the islands or hazards we might see along the way and course taken by other boats making the same crossing. We learn that there are three optional courses across, each with its strengths and weaknesses. We can devise a SWOT analysis (Strengths, Weaknesses, Opportunities, Threats) for each of them. The map below shows our choices. This is a strategy that has some clear risks but also enticing opportunities. It takes us northeast along the U.S. and Canadian coastlines. As the prevailing summer winds are out of the southwest, we’ll be sailing downwind, which should give us more speed. We’ll also be assisted by the Gulfstream currents, which run along a path from the Bahamas northeast into the Atlantic at an average rate of 3 knots. Then, if weather patterns hold, we should have good winds reaching down the European coast to get to our destination. The risk is that we’ve added about 1,000 miles to our course, which means we need to average 9 knots, which is pretty aggressive. Another risk, more precisely, a threat, is the possibility of sailing among drifting icebergs, once we’re off the Labrador coast. Our research has told us that iceberg fields breaking off from the Greenland glaciers are common during the summer months. That’s not a problem for us during good weather but it’s difficult to see an iceberg at night (memories of the Titanic). So in the end, we have a potentially fast crossing to meet or exceed our objective but with some significant risks. This is a strategy that takes the shortest possible course using the curvature of the earth to shorten our path. It still has the potential risk of icebergs but it is more manageable if this becomes a problem. We’ll gain less of a push from the Gulfstream and may find ourselves stuck with low or no wind for days in a mid-Atlantic high-pressure system, but it seems to strike a middle ground that still makes our objective within reach. Our three strategies are not too different from what we may see in business, one that is high-risk, high-reward, one that is safe but potentially slow and one that is a middle ground or compromise between the two. Which should we choose and what happens if we recognize that we’ve made a mistake? Suppose we’re aggressive and have tremendous confidence in our abilities to manage the boat and navigate the seas. Past success might even blind us to some of our weaknesses. When hubris takes over decision-making can be reckless (memories again of the Titanic…or hundreds of failed businesses). Let’s assume we select the high-risk course that takes us far north but in doing so, we either find the hazards of icebergs to be too many, the seas to be too rough or even the winds to be less than we anticipated. As a result, we decide to change strategies and move mid-course to another direction. 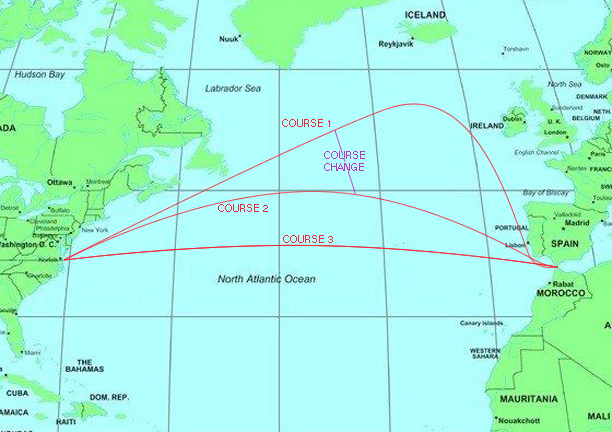 One look at the “course change” on the map shows the cost of making this correction, which is likely to make our objective much more difficult to reach. The lesson, of course, is that selecting the wrong strategy and making a change has costs, which can be significant. What about tactics and goals? How do they factor in and how should we think of them. During any period of time, we’re going to take specific actions to increase the speed of our boat. We might put up different sails, larger or smaller, to better take advantage of changing winds. Or, we might want to be on a slightly more advantageous course to gain speed. These are tactics but are not strategy, as they don’t alter our overall direction in reaching our objective. Imagine a boat (or a business or someone who hits the ground running) that is all tactics but has no strategy. It would always take every possible action to increase its speed regardless of the direction it is heading. It might even go in circles and get nowhere very fast. Tactics will not reach a productive objective without strategy to provide guidance. Finally, where do goals fit in? Goals are long-term milestones that you want to achieve. (e.g. “I want to be a better sailor/manager/person.”). Objectives are fixed and have specific requirements, which can be measured. Objectives have structure; goals do not. Goals can never be accomplished without objectives but objectives without goals won’t create the long-term change you desire. Hopefully, that clarifies things. Following college, I crewed on a large sailboat crossing the Atlantic. Our owner chose “Course 3: Nice & Easy” and we paid a price for it. It was slow, slow, slow – 27 days across. But one of my strongest memories of that trip was listening to our marine radio and hearing reports of sailboats dodging icebergs in high winds only a thousand miles to our north. It was an example of how the wrong strategy can have its costs, either going too slow or too fast, but it cemented the concepts in my mind forever. At FutureShift, we provide research-based strategic services, but are often asked to run workshops that help clarify the confusion around objectives, strategy, tactics and goals. FutureShift is a data-driven strategic and brand planning company, which uses its proprietary software to develop databases and customer feedback that enables direct communication to any user defined segment. If you’re like most people in business today, you’re probably talking about “Big Data” and what it can do for you. One can hardly scan the business section of any newspaper or magazine without reading about it. On April 15th NY Times, columnist David Brooks wrote an excellent article about the limits of Big Data. It’s titled, “What You’ll Do Next”. It was of interest to me because we offer large-scale, qualitative customer intelligence to our clients with the ability to instantaneously email people who share a distinct set of differences. Let me explain because it’s really quite simple. The purpose of research or recording data (quantitative or qualitative) is not to tell you what people have in common but what drives them apart. If in your marketing, you find the common denominator between all your customers and then deliver them a message that addresses that commonality, you’re actually speaking to no one. You haven’t addressed any particular interest that anybody has that might indicate that you understand their specific needs. This is why we use (or build) your database to tell you how your customers are different from each other and how they want that difference to be addressed. As Brooks points out, “People are discontinuous…the passing of time can produce gigantic and unpredictable changes in taste and behavior, changes that are poorly anticipated by looking at patterns of data on what just happened.” Nothing could be truer in marketing today. We’ve all probably experienced this when buying products ranging from books to vacuum cleaners from Amazon. You’ve surely seen, their notations that people who bought these books, also bought these. What they’re doing is simply taking your history of book buying, comparing it to others with similar lists and laying what those people bought next onto your page. In other words, past history from people like you equals future purchase probability and with enough purchase data, there may be some accuracy in that prediction. However, Amazon can’t know that last week I had no interest in buying books about terrorism and this week, sadly due to the events in Boston, I do. Until I make my purchase, but then all kinds of things can intercede with my buying decision. There are just too many potential disruptions to patterns of purchases to be good predictor of future behavior. We’ve created a forward-looking mirror called DirectLink™ We ask your customers “what if” and “why” questions. We capture their words and then quantify their ideas, perceptions and motivations. Then, we give you the ability to instantly segment them and download the email addresses of any segment you select. With DirectLink™, you can immediately see what differentiates your customers, the words they use to describe their differences and their emails so you can you respond specifically to their unmet needs. Most purchases are motivated by either frustrations or the need to fulfill unmet needs. 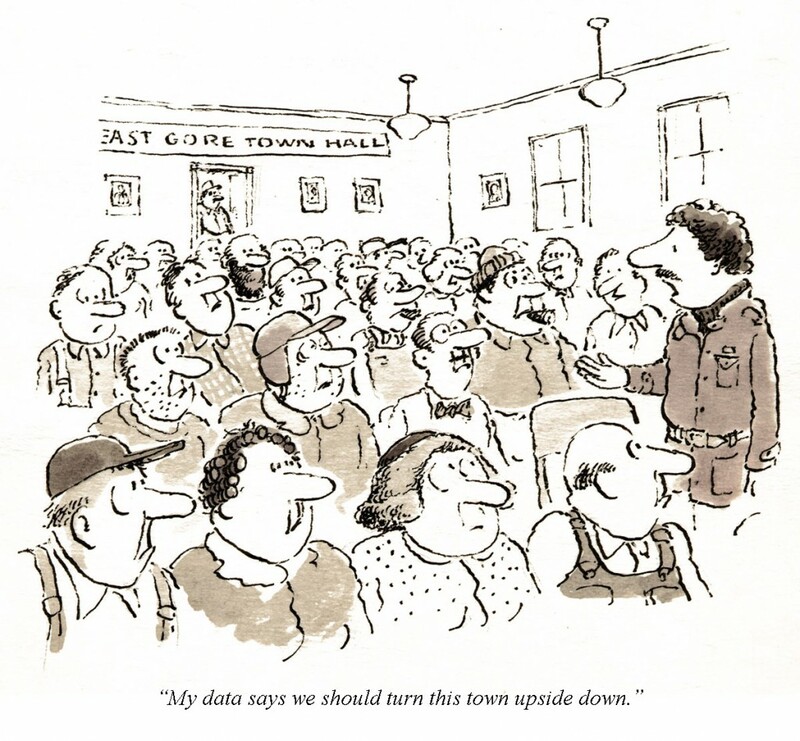 Big Data doesn’t engage customers to determine their frustrations or needs. DirectLink™ does. In doing so, you are directly engaging your customers to increase loyalty and ultimately, sales. As many of my friends and associates know, I create a holiday cartoon every year with my good friend and former business partner, George Hughes. 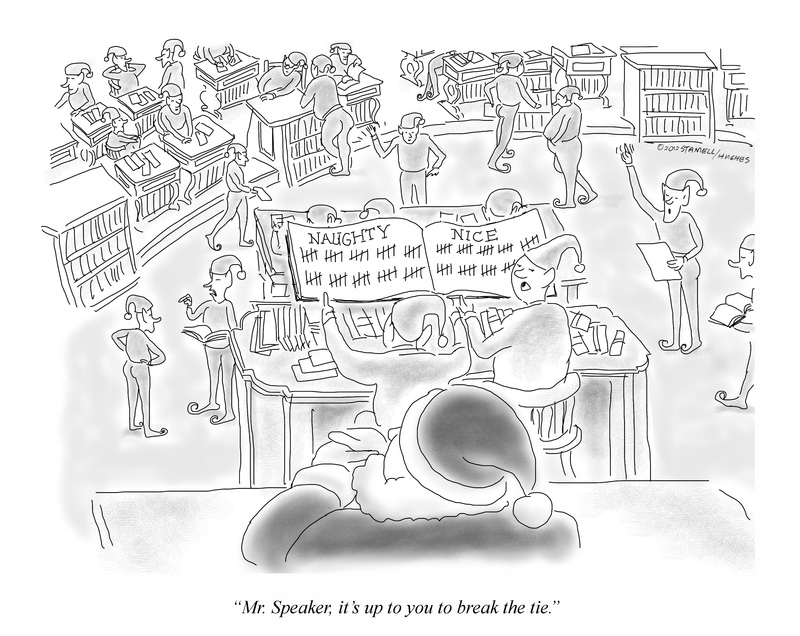 This is the twelfth year that we’ve created a cartoon as the centerpiece of our holiday card. George and I used to own an advertising agency together and we began to create cartoons there as one of the agency’s creative teams. Now, as owner of my strategy consultancy, Futureshift, and George, who has gone onto wherever old artists go, continue to take on this annual project. George illustrates and I write, although our best work has always come from equal collaborations. When I moved to New York in 2000, through a series of coincidences, the famous cartoonist, Jules Feiffer, saw a few of our cartoons, liked them and sent me to The New Yorker to meet with their cartoon editor, Bob Mankoff. When I called Mankoff, I used Feiffer’s name, which I’m sure is the only reason he took my call. He told me to come in the following Tuesday and bring a lot of work. I showed up at the appointed time with around a hundred cartoons. Mankoff went through about 30 of them, never cracked a smile, told me most of them were terrible and before I could run to the door, said, “Show up every Tuesday with new work.” That’s the way of the The New Yorker, I suppose. For the next six months, I showed up every Tuesday with 7 to 10 new cartoons. However, being a cartoonist wasn’t my day job nor was it George’s. Mankoff always would tell me how we weren’t funny or our jokes didn’t work and then he’d hold onto a couple to take into their final grouping of 50 to choose from for that week’s issue. Our problem, he lectured me one week, is that we were a team and he didn’t like the idea of teams. After a few months, he began to support our work more but eventually, we ran out of steam in the face of having other priorities. Maybe he was right about teams. 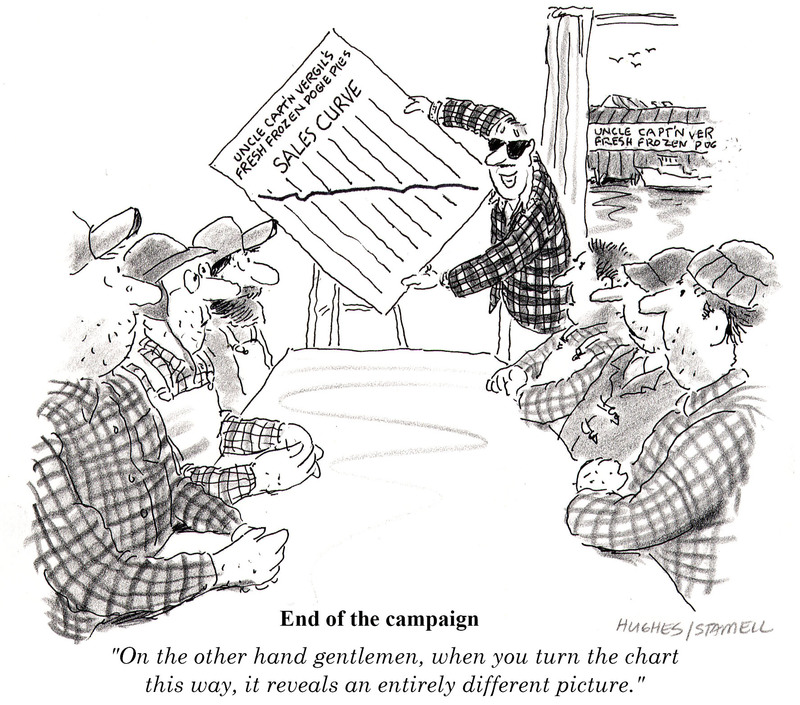 The process of coming up with a good cartoon is not all that different from developing a marketing strategy. Strategy formation requires taking a complex set of both internal and external inputs and distilling them down to a single direction that fulfills unmet needs. Cartooning does the same but it ends with turning the situation upside down or placing it in a prison, doctor’s office, caveman times or some other real or unreal situation we can all envision. 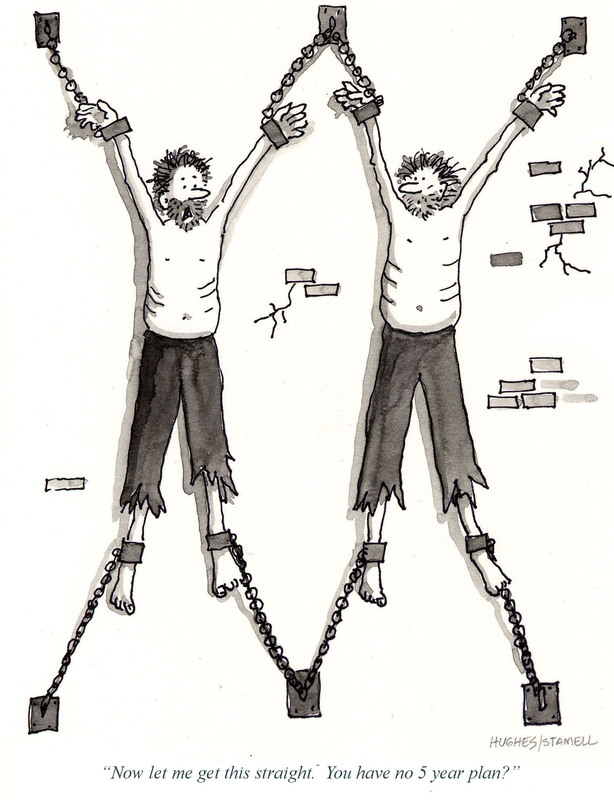 Today, George and I come up with fewer cartoons but we always work on one for the holidays. Typically, we talk about the year’s news and try to work up ideas based on what people have been talking about that is still current or top-of-mind. Some years have been a lot tougher than others. I think the most difficult year for us was 2001 following 9/11. It was impossible to come up with an idea that would be funny or ironic. I don’t recall now what triggered the idea of the cartoon below that was the result, but it seemed right for the times. There was no caption. There was nothing that needed to be said. By 2004, the country was beginning to relax a bit more but still always conscious of our enemies around the world. 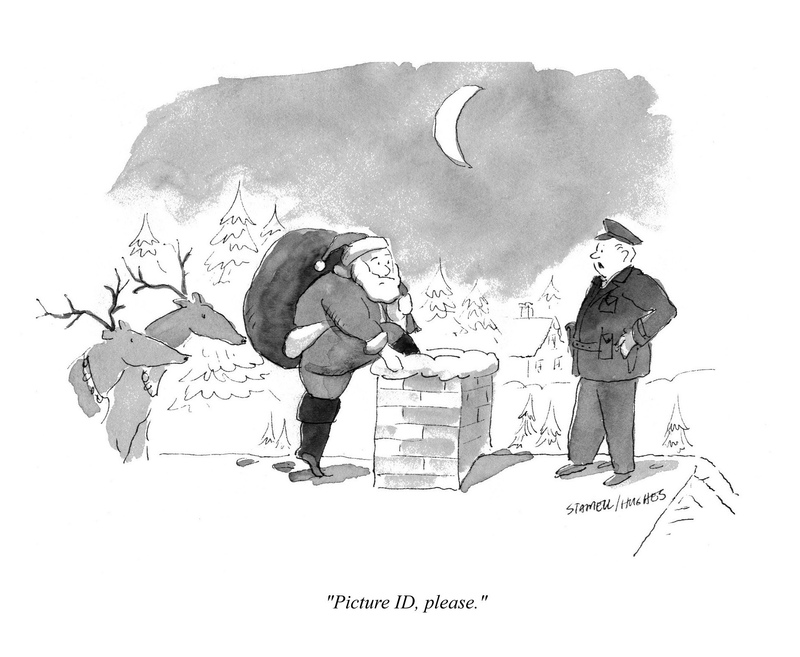 Santa, too, we thought, would have similar concerns and we came up with this. We’ve moved around to a lot of different topics including the economy, labor, health and nutrition and last year, focused on the 1% who have become so wealthy during the last decade, even Santa. 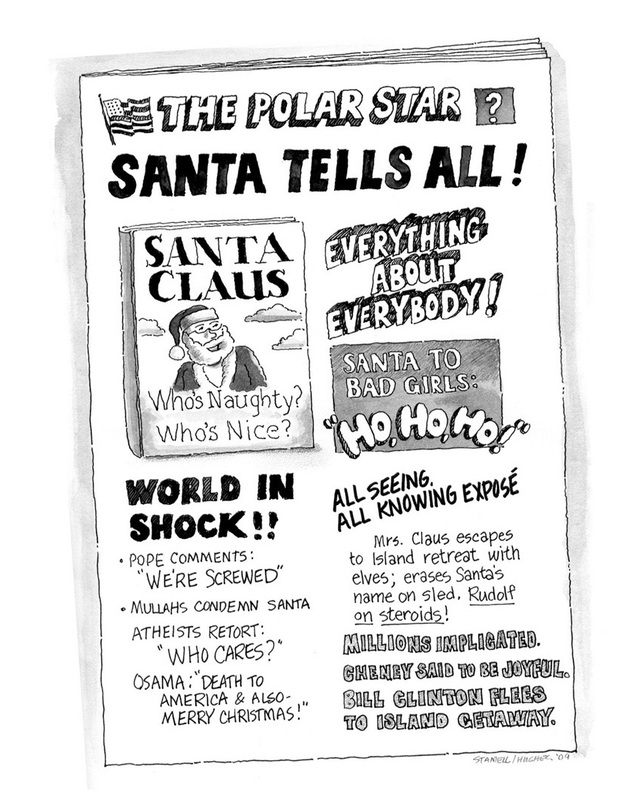 All of our Christmas cartoons can be seen at the Gigundo Industries website and that brings me to 2012. What else is there to say? 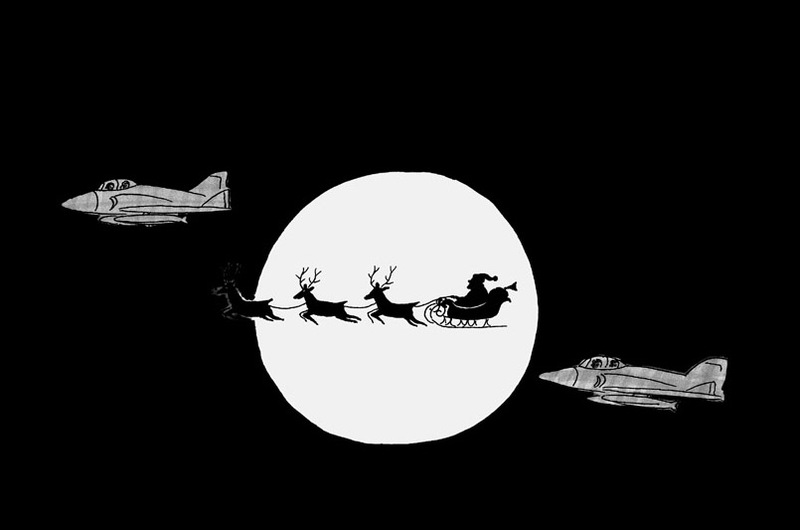 We’ll all find out on Christmas how Santa decided. I hope that you and your families have a day filled with love, peace and joy. 1. See what they’re writing in real time – as they write it! Now, you can actually monitor what your community is saying about you and how they’re answering your questions. Take a look at the example below for one of our clients that is a wine producer. 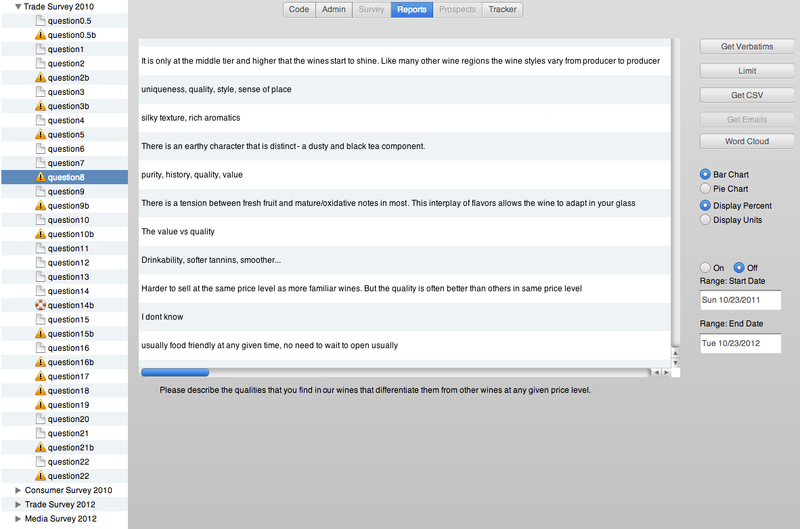 The question asked is “Please describe the qualities that you find in our wines that differentiate them from other wines at any given price level.” With one click on the button on the upper right that says “Get Verbatims”, everything written in answer to that question immediately appears. And if you want to see all of the text responses quantified, you simply close the verbatims screen and bar charts appear showing how all of the answers have been categorized. In other words, we’re quantifying qualitative information – conversational text – and enabling you to see the actual words behind the data. It’s like listening in to hundreds of conversations about all the questions you want answered about your brand. 2. See the key words they use while they’re using them. When considering the key needs among your customers to address, it helps to know their top-of-mind thoughts. Word clouds can provide a quick look at what any customer group is saying about your brand. With one click on the “Word Cloud” button, you’ll see your word cloud develop before your eyes. DirectLink™ automatically throws out the meaningless words such as articles, pronouns and other common words that might improperly skew the response. Still, there will be words you’ll see in the word cloud that get through the screening process but don’t provide insights. DirectLink™ enables you to quickly toss out those words. 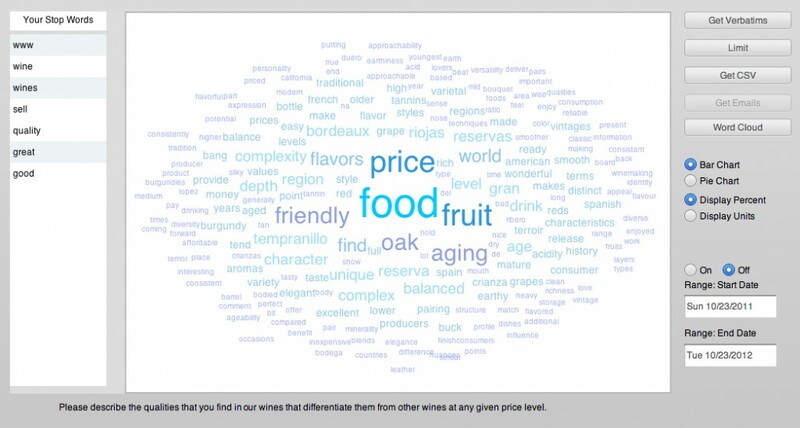 For answers to the same question as above, “Please describe the qualities that you find in our wines that differentiate them from other wines at any given price level.”, we tossed out seven additional words to get the picture above. It’s as easy as clicking on the words you don’t want and the word cloud quickly reforms. 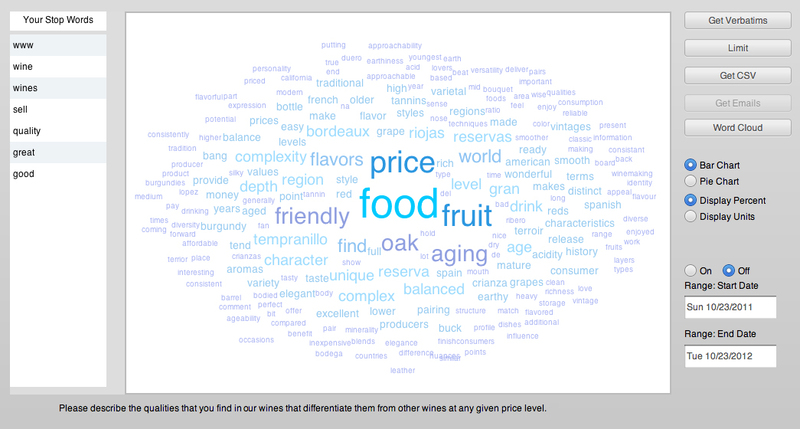 With this feature, you see the top-of-mind thoughts your customers have and the descriptive words they use. Every product or service creates its own lexicon of words that both the trade and consumers use. Now, you can see what those are and use them to talk to your customers. 3. Segment your customers instantly and respond immediately. A common reaction to seeing what people say about you is to think “if only I could talk directly to these people about their beliefs. Then, I could convince them.” Now, you can! 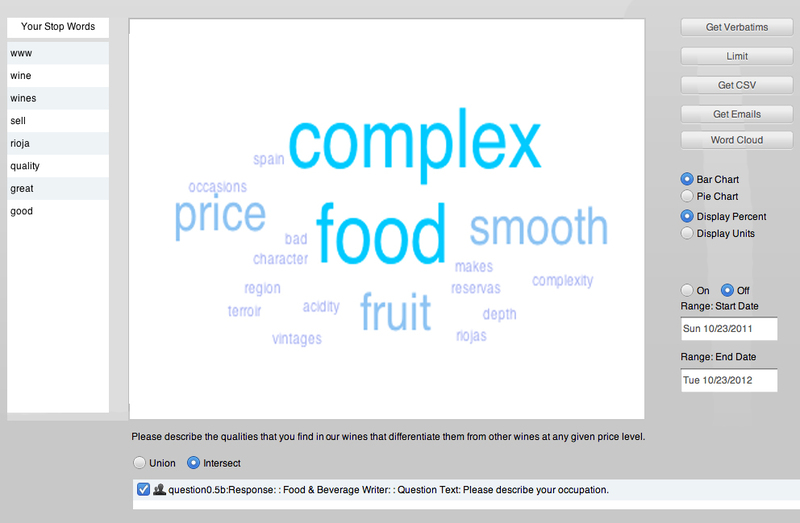 Whereas the top-of-mind words used by the larger audience were “food, fruit, price, friendly, oak, aging”, the media has prominently added “complex” and “smooth”. If we were to speak about these wines to a journalist then, we might stress both the complexity and smoothness of the wines as being key factors that make them so good with food. It’s this type of parsing that can enable you to tailor your response to any particular trade or consumer group based on factors that you define. Now, let’s go a step further because DirectLink™ makes a seamless connection between survey responses and direct marketing. Among the DirectLink™ features on the control panel, you’ll see that there is another button on the upper right that says “Get Emails”. Clicking this button immediately downloads an email list of only those people who responded to the question or multiple-questions you selected. You can send them an email using the words they’ve used in response to your question that is specific to their ideas, perceptions and beliefs. Who can use these 3 features that come with DirectLink™? Brand marketers trying to understand what people think about their products. Sales managers who want to improve and tailor their sales pitches. CEO’s who want to test a new strategy with their customers. HR managers who want to assess employee morale or improve internal services. Trade association managers who are seeking ways to raise awareness and open doors for their members. Foreign trade development officers who want to better understand what makes their country attractive. Tourism departments that want to know what will motivate consumers to visit. PR and ad agency account executives who want to know what’s on their client’s customers’ minds so they can address them in marketing communications. University and college administrators that want to understand and respond to student or alumni views. Non-profit development directors seeking the keys to increased fund raising. Political campaign managers who need to understand what voters want. The list goes on and on. 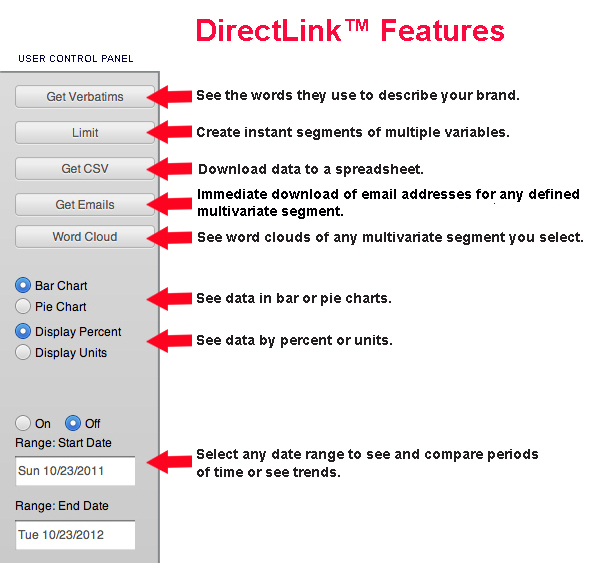 All of the above have used DirectLink™ in the past and now these new features make it even more effective and faster. We can make your social media programs more effective and improve the ROI of research or direct marketing programs. If you’d like to know how DirectLink™ can help you and see an online demo, let us know. It has been several days now that we watched the Vice Presidential debate and have been subjected to a discussion that’s more about whose demeanor and facial expressions have been better than about their policies. Depending on from which side you see things, President Obama has either brought the economy back to a place where it can now recover or he’s brought us to a Leninist-Marxist precipice. Governor Romney is either the biggest liar that has ever run for president or he is just the man we need to help America get back to its revolutionary roots. It’s that extreme and it’s that myopic. We’re losing sight of the big picture. Yesterday, I attended the annual shareholders’ conference for The Baron Funds, a group of mutual funds led by Ron Baron who believes that it’s the quality of people who make great companies and that investing in them is a long-term bet on America. The event is held each year at New York’s magnificent Lincoln Center. 4,000 shareholders attended. During the morning, you get to listen to presentations from CEO’s of companies the funds have invested in. Then at lunch, various entertainers perform in one of the many auditoriums at the Center. 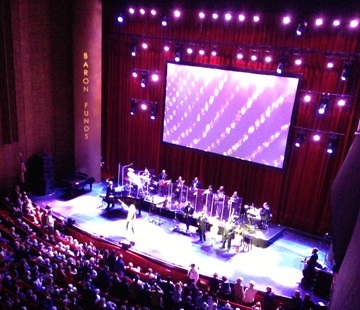 Yesterday, the choices were British rock singer Joss Stone, Broadway star Kristin Chenowith, or jazz stylist Harry Connick Jr. After returning from lunch, the senior analysts from each of the Baron Funds engages in a panel discussion about the past year’s performance and how they pick stocks. When this ends, there’s a musical performance from a big name headliner. In the past, it has been people like Rod Stewart, Bon Jovi, Elton John and others who you’d pay a lot of money to see elsewhere. 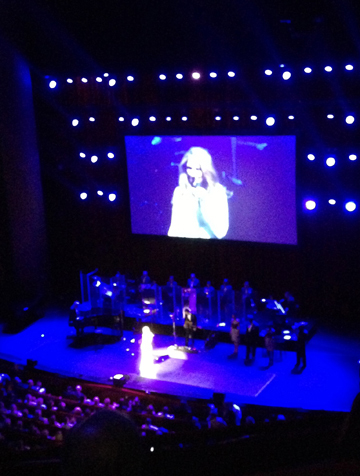 Yesterday, the headliner was Celine Dion – more on Celine later. David Rubenstein, Co-Founder & Co-CEO of The Carlyle Group showed a different set of values for private equity firms than we’ve seen during the past year from Governor Romney’s turn at Bain. From its start in 1987, Carlyle now manages $160 billion in investments with the goal of supporting good companies that create jobs and prosper for their shareholders AND employees. For all his success, Rubenstein exhibited an amazing self-deprecating sense of humor and stressed the importance of giving back to America. He has put his money where his mouth is by joining Warren Buffet in giving his fortune away. What came across more than anything is that good values build great companies. By the way, he said he has no problem with the regulations imposed by Dodd-Frank, which some politicians want to remove. Steven Spinner, CEO of United Natural Foods was a little more meat and potatoes in his presentation…well actually, more tofu and bulghur… but he expressed a need to be more conscious about our environment and both the chemicals we put into our environment and our bodies. The company is now the largest distributor in the U.S. and Canada of natural and organic foods and has become a $4.5 billion company with 65,000 sku’s and 23,000 customers. Healthy foods raise our awareness of our environment and build successful businesses – quite a contrast to the right wing preaching that the government (and in particular, Michelle Obama) is trying to force feed us healthy foods we don’t like. Robert Katz, CEO of Vail Resorts showed how a sizable business ($1 billion +) dependent on nature can prosper when it focuses both on good environmental stewardship and helping people enjoy all the recreational possibilities that enables. What’s interesting is that they don’t own the land their resorts sit on. They lease it from the National Forest Service, and have to work with the Service to show they are deserving of both permits and leases – a great example of how government helps improve our lives, supports business and is worth the investment we all make in it. Frank Coyne, CEO of Verisk Analytics is all about Big Data. This company dominates the insurance risk assessment business. I have no idea of his political leanings (or most of the others for that matter) but he’s a former Marine who grew up in a lower middle class family from Scranton, PA. There was not a trace of ego in his presentation. He is clearly an American success story who rose from the middle – no trickle down there. Kevin Plank, Founder and CEO of Under Armour, a $2 billion company that began in his basement in 1996, told an amazing story of how his experience as a college football player took him on a search to find better performance athletic clothing. He displayed optimism, competitiveness and personal charm in telling his success story. There was not a hint of dismay in his approach to the future. Rich Barton, Co-Founder & Executive Chairman of Zillow, Inc. was the moderator of the analysts’ presentation so he wasn’t really focused on his or his company’s story. However, he founded both online travel giant, Expedia, and Zillow, an online real estate search site. He’s another American success story who displayed extraordinary optimism. Baron gave his outlook on the economy, the stock market and reminded us why a long-term investment philosophy in good people who build great companies pays off . He praised Federal Reserve Bank Chairman, Ben Bernanke for his stewardship of the economy to a smattering of applause. He showed how the stock market has climbed 60% since the days of doom and gloom four years ago to wild cheers. Then, came the part that left me stunned. He noted that we’re soon to have an election between President Barack Obama — maybe 20% of the audience applauded — and Mitt Romney to loud, enthusiastic applause that drowned out anything that had preceded it. It left me wondering whether anybody had been paying attention all day. The contrast to private equity investing with the Romney approach from David Rubenstein ‘s Carlyle Group couldn’t have been clearer. Protection of our food sources and environment have helped businesses succeed, not fail due to over-bearing government regulation. The economy never fell off the cliff. Businesses and the stock market prospered and now they’re cheering for an uncertain change that promises to strip away a lot of the government support and regulation that has contributed to both success and fairness? I don’t get it. In the end, just like Ron Baron says and practices, it’s about people and their values. Not only do good people build great companies but they also build great countries. I left the conference a little dismayed at the shareholders’ reaction to the election but still optimistic about the long-term. To that, I can thank Ron Baron for this annual event. This brings me to Celine Dion. I’m not a fan and never have been. She’s too kitschy for me. Yes, she’s talented and a professional song stylist who’s benefited from great writers but in one song, Kristin Chenowith blew her away. After all the great rock stars I’ve seen at this event, I was surprised at her appearance. “Las Vegas East”, Ron Baron called it. It certainly was. 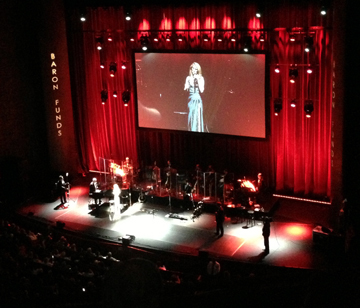 Her big band, violins, lots of costume changes and a self-aggrandizing video were all on display. Like so many other successes — only in America. I thought of staying for a few songs and then leaving but then I thought of my daughter. She’s a fledgling comedy writer in LA and she loves Celine. She’s dreamed of going to Las Vegas to see her and has even asked me to foot the bill for the $250 ticket. You can imagine how far that went. But as Celine came on, I texted her knowing that she would be excited. It was only the texting banter between us that kept me there for the duration. So the afternoon entertainment is Celine. You are breaking my heart. HOW IS IT THAT YOU GET TO SEE CELINE DION PERFORM AND I NEVER HAVE? Is she amazing???? OF COURSE SHE IS!!!! I guess because I own $30K of Baron Funds. I wish you were here. She’s too sappy for me. I don’t know how long I can last. OMG omggggggg!!! Just revel in it. Imagine her an alien from a special planet where the wind is always billowing her hair and dresses! A lot of eyebrow action and the motions. WAIT! We have violins! It’s a costume change! AHHHHHHHH. WHAT IS THE NEW COSTUME? We’re waiting with bated breath. Maybe she went out to pee. I’ll record Titanic if she goes there. OH SHE WILL AND YOU BETTER. She tucks her 3 little ones into bed and there’s video to prove it. It’s “Beauty & The Beast” time. Oh, I love that one. This is so unfair, it hurts. What will it be? There’s James Bond music. A medley of 007 songs. She’s got her fist in the air. The audience is in a state of rapture. Now, she’s patting her hip and swaying. This Québécois lady knows how to have a good time. I’ve run out of responses. It’s “All by myself” now. I know how she feels. Carla left to go to a meeting. So sad. Double fist pounding on her chest. Serious stuff. Now, she’s singing “Spinning Wheel”. Am I back in college? This is amazing. Never forget how amazing she is. Here we go: I’m sinking. There’s an iceberg and the ship is going down. I’m recording this. The Baron Funds Annual Conference is one of my favorite days of the year. I am reminded of why I am in business and what I tell my clients through my consulting business. I’m entertained in this incredible city and my belief in America is always restored. This year, it also provided some fun with my daughter. Is there anything better?